Not much to be found about this Immortal. One of the leaders of the Yamashina temple community was the monk 中筹 Chusan, who was staying at a small residence near the Kangaku-In while his community was putting pressure on the government officials. One night, in the presence of a number of his disciples, Chusan suddenly said that someone was approaching, but his disciples could see no one, no matter how hard they looked. Nevertheless, shortly afterward the disciples could hear Chusan conversing with someone, and when they asked him with whom he was speaking, he replied that it was Ryogen of the Enryaku-Ji. the monks incredulous, exclaimed: "What are you saying? But, Ryogen is dead!..." Then, realizing that it must have been the departed spirit of the deceased Ryogen that came to speak with their master, they became speechless with fear. The next day Chusan, saying that he felt ill, excused himself from attending the hearing on the Gion question. Without their leader, and recalling the eerie event of the preceding night, the monks of the Yamashina temple were confused and upset, and when the court failed to issue the judgement that they were hoping for, they quickly left Kyoto and withdrew to their home temple. ... Chusan died in 969, sixteen years before Ryogen died . . .
. Kōfukuji, Koofukuji 興福寺 Kōfuku-Ji . Kōfuku-ji has its origin as a temple that was established in 669 by Kagami-no-Ōkimi (鏡大君), the wife of Fujiwara no Kamatari, wishing for her husbands's recovery from illness. Its original site was in Yamashina, Yamashiro Province (present-day Kyoto). 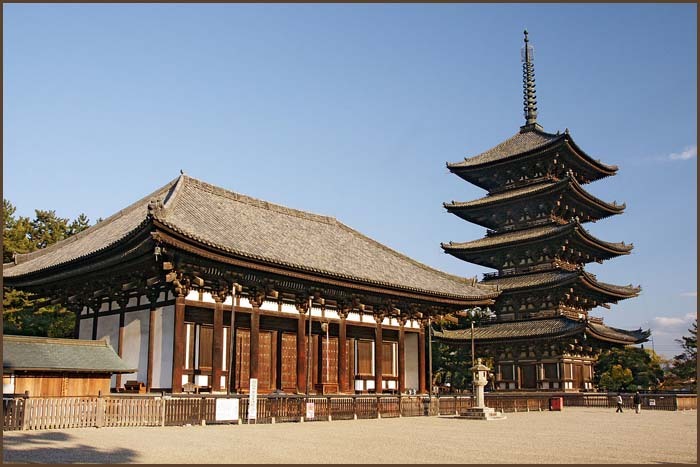 In 672, the temple was moved to Fujiwara-kyō, the first artificially planned capital in Japan, then again in 710, moved to its current place, on the east side of the newly constructed capital, Heijō-kyō, today's Nara. kanda (sao-uchi) means "hitting with a pole". The quest for an immortal life is long and difficult, and some try very hard but do not get anywhere. 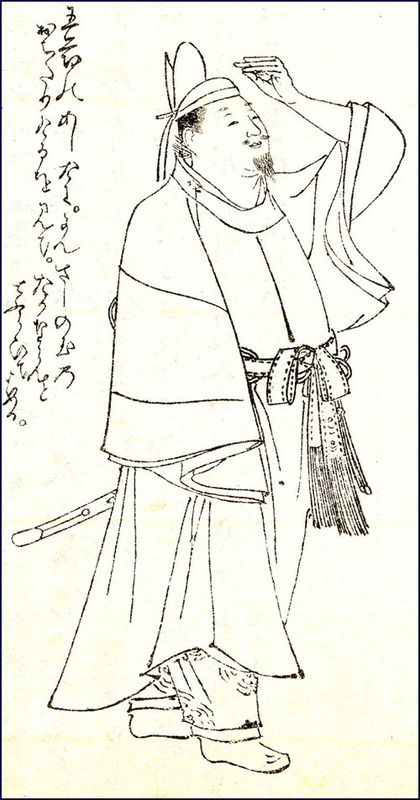 Sao-Uchi lived in the Nara period, but not much is known about him. It seems he took a lot of elixirs of immortality, but his body never got light enough to fly. He had almost given up of ever making any progress, when he made another effort and could fly above the ground for about 2 or 3 meters. The other villagers thought this was something special not everybody could do and begun to respect him. Bud the bad kids of the village made fun of him and hit and chased him around with a pole like a butterfly. In haste he jumped up again, but again they came after him with the pole. Eventually he became invisible . . . at least nobody knew where he had gone. 本朝神仙記伝 / 本朝神仙伝 Honcho Shinsenden - Lives of Japanese immortals. was a Japanese poet and statesman. He was born the son of Emperor Saga and a member of the Saga Genji clan. He is sometimes mentioned as the model for Hikaru Genji in important Japanese literary classic The Tale of Genji. who else would have made me feel as disturbed?
. Matsuo Basho visiting Shinobu .
. Michinoku roads みちのく路 . and for no one else but you. 6 km north-east from Fukushima City sits the village of Shinobu (present-day Mojizuri). 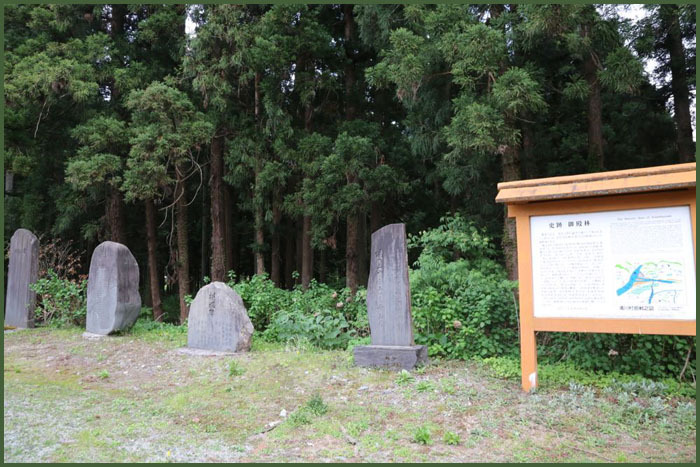 Three seemingly unconnected objects - a large, moss-dappled rock, the Michinoku (Tohoku) kimono design of mottled ferns made famous in the Heian period (794 - 1185), and an impossible love story - have together made Shinobu a vastly recognized and esteemed location of utamakura. Utamakura is a place-name used in waka (traditional Japanese poetry) which, through alternative readings of the name's kanji (Chinese characters) or its associations with national histories and figures, can be used as an allusive tool towards sentiment and meaning within waka; an incredibly popular and admired poetic device which was employed even in everyday conversation at the Heian Kyoto Court. In the 9th century, Minamoto no Toru (a high-ranking noble of the Heian Imperial Court in Kyoto) traveled to the "great north," Michinoku, which was at that time deemed an uncivilized land due to its distance from the shining capital. At some point, he passed through Shinobu, a village well-known by the Imperial Court for its unique production of a kimono design called Shinobu Mojizuri (fern mottle). It was not uncommon for high-ranking nobles to undertake vast journeys north for state affairs. And on these journeys, it wasn't completely unheard of to learn of nobles falling in love with villagers of little, or no, social status. Unfortunately for Minamoto no Toru and the lady of Shinobu, he did just so. Staying with the lady's father and delaying his return to the capital for over a month, he was eventually called back to court and the separation was impossible to withstand for both of them. 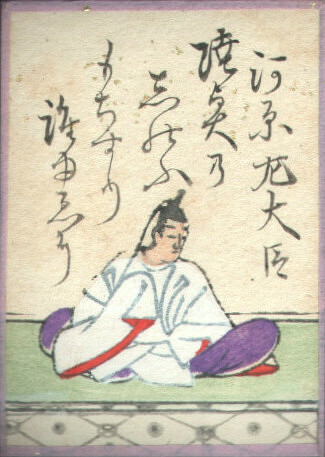 Minamoto no Toru did as all Heian courtiers in his day could do; he wrote a poem about it. And the lady of Shinobu took to her bed with grief, dying before the verse could reach her. The verse adopts the word 'shinobu' and its three potential readings in Japanese: the name of the village Shinobu; the type of fern found in abundance around the village, called shinobugusa; and the verb shinobu, "to love secretly." In just five lines, Minamoto no Toru encapsulates his sentiment, the history and relevance of the setting to his story, and appropriate similes for such a saddening poem in incredible subtlety and talent in his employment of utamakura. 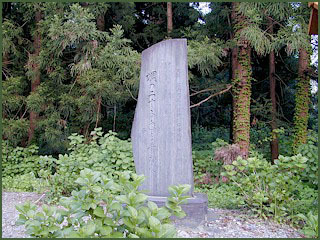 Since this all occurred over twelve centuries ago, Shinobu has welcomed such admirers of its history and poetry as Basho Matsuo, who came to compose a haiku on the subject in his Oku no Hosomichi pilgrimage of Michinoku utamakura locations. 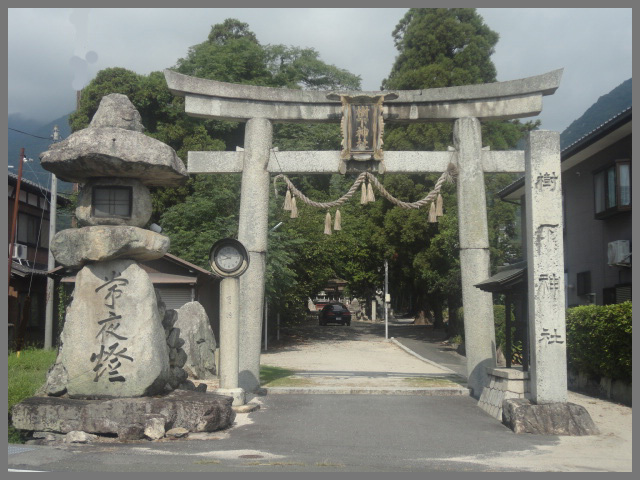 The mottling rock upon which the famous Michinoku kimono was mottled with fern is enshrined by an open gate. The two poems are also on the grounds, set in stone. All are surrounded by a wonderful view of Fukushima, the Kannon-Do Temple and Phoenix Pagoda, and a river also famous in traditional waka, the Abukumagawa. Minamoto no Toru stayed some time at the residence of a rich family near the Mojizuri Ishi stone. He fell in love with the beautiful Torajo 虎女 (Tiger Woman), but eventually he had to go back to Kyoto. There was no further news from him. Torajo was so sad, waiting and waiting for her lover. She made a vow to the stone, to show her the image of her lover Toru. After praying for many days, her wish was fulfilled and his figure appeared on the stone. kagami ishi 鏡石 mirror stone. Most of the stories of ghosts are about people becoming ghosts and appearing as a skull. One of the oldest records is the Nihon Ryooiki 日本霊異記 Nihon Ryoiki. 宇多院 Emperor Uda (867 - 931) made an official visit to 河原院 Kawara no In (the official residence of Minamoto no Tooru 源融 Toru (822 - 895). The late owner of this Kawara residence, Toru, appeared clad in 衣冠 formal robes as a ghost to greet the visitor. When 栄爵 Eishaku and his wife from the countryside came to Kawara no In to find work, she was taken away by a demon. He was a monk in the Nara period. Not much is known about him. He was born in 備前国津高郡波珂, now 岡山市北区芳賀 Kaga, Okayama city. Other sources quote he was born in Nara prefecture. At the age of 15 he became a monk at the temple 法華経寺 Hokekyo-Ji , now 岡山市北区日応寺 Nichio-Ji in Okayama city. He took on the name of 快賢芳賀坊 Kaiken Kaga-Bo . At the age of 30 he went to 大和吉野山 Mount Yoshinoyama and later to the temple 山城国清水寺 Kiyomizudera. There he learned how to jump freely up to the clouds in the sky. Together with 摩訶上人 Saint Maka Shonin he organized 備前国内に四十八ヶ寺 the Pilgrim Route to 48 temples in Bizen on behalf of 孝謙天皇 Emperor Koken (718 - 770). The Emperor had fallen ill in 752 and wanted to something special to get better. Ho-On founded the temple 報恩山子嶋寺 Hoonzan Kojimadera in Nara. In the back of Kobo-Ji is a hall in honor of Ho-On, 報恩大師堂. 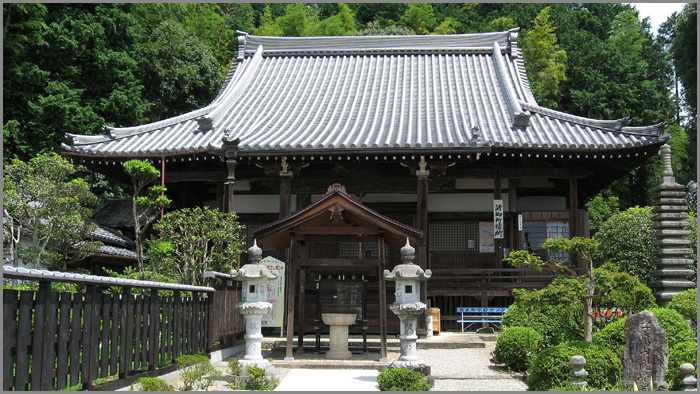 One of the sacred sites of the Kannon Bodhisattva in western Japan, said to have been founded in 760, this temple followed Tsubosakadera and Hasedera in prosperity during the Heian period. Its gate, a secondary gate of Takatori castle relocated here, is the only portion of the castle buildings to survive. When the head priest said prayers to cure the illness of Emperor Ichijo and he healed completely, he was granted as reward the Mandala of the Womb Realm scroll, which is a designated National Treasure. The scroll is in the custody of the Nara National Museum, and a replica hangs in the temple's image hall, where it can be publicly seen. 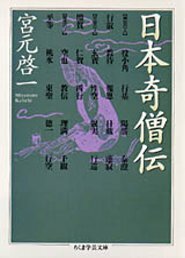 Kojima mandara　子島曼荼羅 / Also read Koshima mandara. A pair of Mandala of the Two Realms *Ryoukai mandara 両界曼荼羅 in gold and silver paint on dark-blue twill originally kept at Kojimadera 子島寺 in Nara. but now preserved at the Nara National Museum. Also known as Tobi mandara 飛曼荼羅 or Hikou mandara 飛行曼荼羅 (flying mandara). The Matrix mandala *Taizoukai mandara 胎蔵界曼荼羅 is 349.1cm X 307.9cm in size and the Diamond World mandala *Kongoukai mandara 金剛界曼荼羅 is 351.3cm X 297.0cm. According to the temple tradition, Shinkou 真興 Shinko (934-1004), who restored Kojimadera during the late Heian period, was given these two mandala by the emperor Ichijou 一条 during the Chouhou 長保 era (999-1004), and they remained treasured possessions of the temple until recent times. Iconographically they differ markedly from orthodox versions of the Ryoukai mandara as transmitted by *Kuukai 空海 (774-835): for example, the 16 deities of the Auspicious Aeon gengou juurokuson 賢劫十六尊 are missing from the Vanquisher of the Three Worlds, Gouzanze-e 降三世会 in the Kongoukai mandara, while in the Taizoukai mandara the positions of Tenkuraion 天鼓雷音 and Kaifukeou 開敷華王 in the Chuudai hachiyouin 中台八葉院 have been intercanged and the number of deities in the Soshitsuji-in 蘇悉地院 has been increased to 16. It is generally considered that they date from around the Chouhou era when they are said to have been given to Shinkou but there are some scholars who place the date of their execution in the early Heian period. They are at any rate an unusually early example of the Ryoukai mandara, and because they are also in an extremely good state of preservation, they have been designated national treasures. Once upon a time, at the temple Kinzan-Ji there lived a huge toad and a huge serpent. They used to fight all the time, but thanks to the spiritual power of High Priest Ho-On they stopped. Now this fight has become a round of "tug of war" with a huge rope at the temple festival. He was born in 869 in 能登ノ国 Noto no Kuni (now 石川県北部（能登半島） Ishikawa, Noto peninsula) in the early Heian period. He was very merciful, he gave his robes to people who had none, he gave his food to people who had nothing to eat. He let the mosquitoes drink his blood. His mother once had a dream about a strong light and then became pregnant with Yosho. The child was very clever and never forgot anything he had heard or learned. 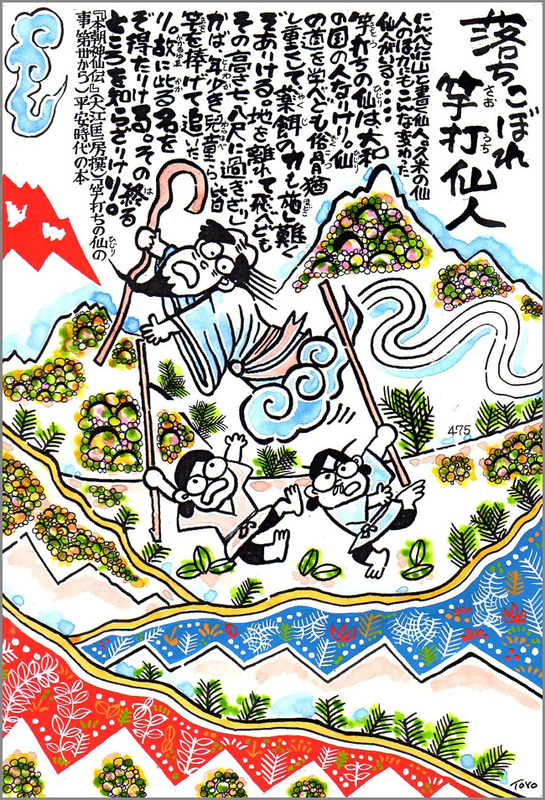 At age 11 he was sent to 比叡山 Mount Hieizan in Shiga and became a disciple of priest 空日律師 Kunichi Risshi. He almost never slept during this time. Later he went on to Yoshino and practised austerities at 金峰山 Kinpusan (Nara prefecture). In winter he stayed at temple 六田の牟田寺 Muden-Ji. But there was not much food and he spent days just eating one grain of millet. At around 80 years of age he became a Sennin. He slept without a blanket even in winter, he jumped on the smoke of incense and made it to heaven as he pleased. He went on to other sacred mountains. To 大峰山山上ヶ岳 Sanjogatake (1719 m) in Yoshino. To the temple 竜門寺 Ryumon-Ji in the 洞川集落 Dorogawa hamlet. His movements were fast and he could fly in the clouds. Through his supernatural power he knew about the coming death of his father, He jumped on the roof of his parents home and begun to recite the 法華経 Hokekyo Lotus Sutra. When the family went outside to have a look, there was no one to be seen. He always came down from the sky to take part of the 不断念仏 fasting rituals at Mount Hiezan. in Japanese religion, a man of great personal magnetism and spiritual power, as distinct from a leader of an institutionalized religion. 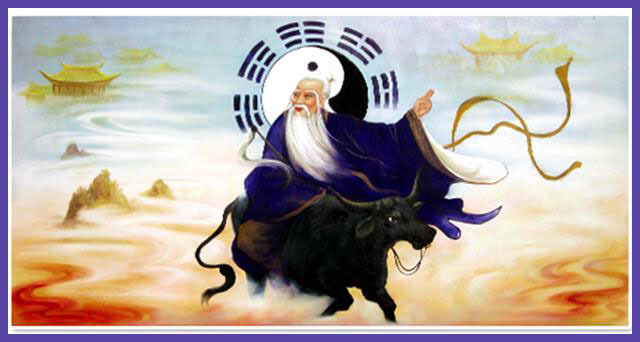 Historically, hijiri has been used to refer to sages of various traditions, such as the shaman, Shintō mountain ascetic, Taoist magician, or Buddhist reciter. 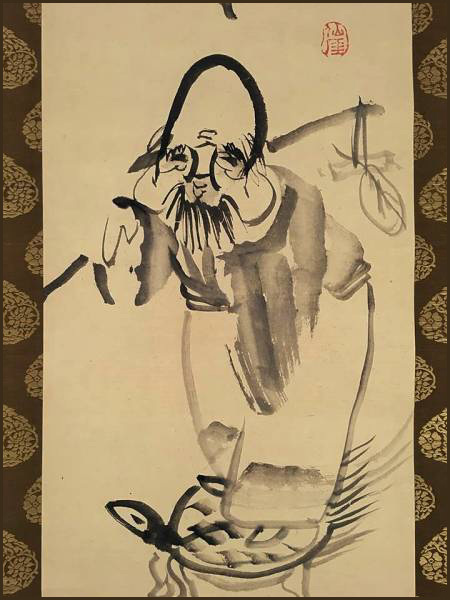 Most characteristically hijiri describes the wandering priest who operates outside the orthodox Buddhist tradition to meet the religious needs of the common people. 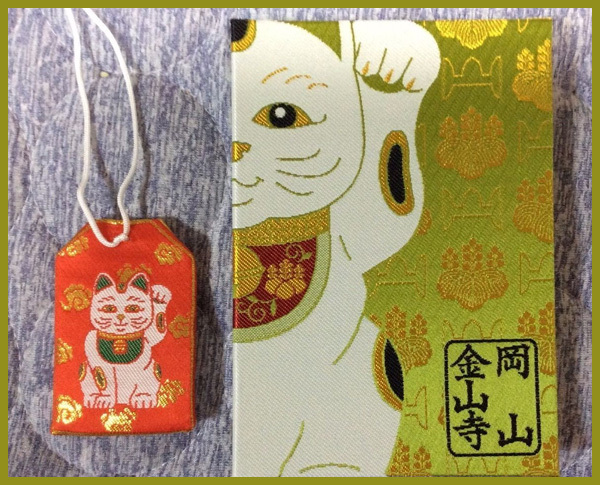 Koya hijiri 高野聖 "mendicant priests from Mr. Koya"
. Mount Hieizan, Hiei-zan 比叡山 . After Chisho's arrival, Kyotai went into a cave and did not come out again. 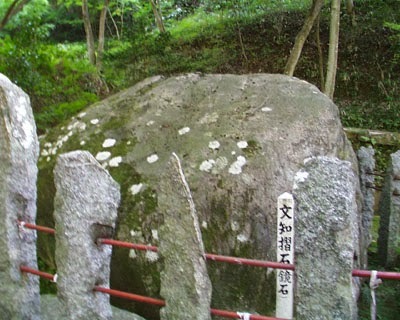 Later Chisho Daishi put up a stone memorial on the cave. Since olden times, people who come here to become a monk have their hair cut and offer it on the altar of this hall.
. Miidera, Mii-dera 三井寺 Temple Mii .
. Chisho Daishi 智証大師 / 智證大師 / Enchin 圓珍 / 円珍 .
. oshoo 和尚　priest - Introduction . The dates of his life are not clear. He was a monk, maybe living in the Asuka or Nara period. 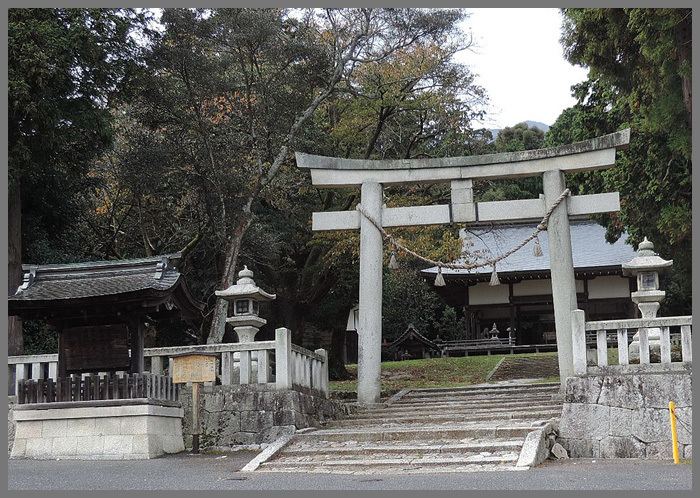 He lived in a hermitage in the 東山山麓 Higashiyama Mountain range in 山城国愛宕郡八坂郷 Yasaka, Atago district of Yamashiro no Kuni. In 778 priest 延鎮 Enchin came to visit him. Gyoei gave Enchin a precious piece of wood and soon after he left for the Eastern Provinces and was not seen again. Enchin was involved in the building of temple 清水寺 Kiyomizudera, together with Sakanoue no Tamuramaro. 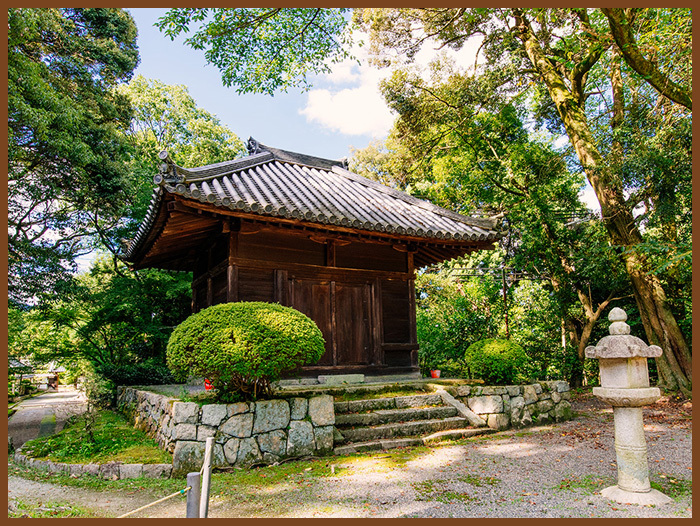 It was said that Kiyomisu Dera was found by a Nara monk named Enchin who practiced asceticism in 778. He met a Buddhist old recluse called Gyoei Koji while wandering nearby Otowa-ni-taki waterfall, to look for a site with a golden stream to build a temple, after being inspired in a dream. 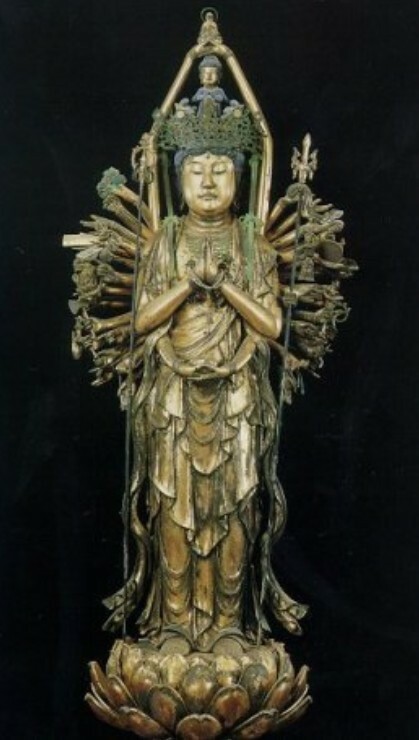 Gyoei told him that he was a devotee to Kannon Bodhisattva and had been waiting for him to come as he was to leave. He presented the monk a piece of wood and left. Monk Enchin soon found a pair of sandals on top of the hill and realized that the old hermit was a Bodhisattva. The monk Enchin later created an image of eleven headed thousand armed image of Kannon and carved it on the sacred log given to him by Gyoei, and built a little hut to house it. The Emperor's old residence that was gifted to him after the emperor built a new palace when moved to Kyoto. The building was made into the main shrine hall of the temple.
. Kiyomizu-dera 清水寺 Kyoto . conquering the Emishi (蝦夷征伐 Emishi Seibatsu) in Tohoku. 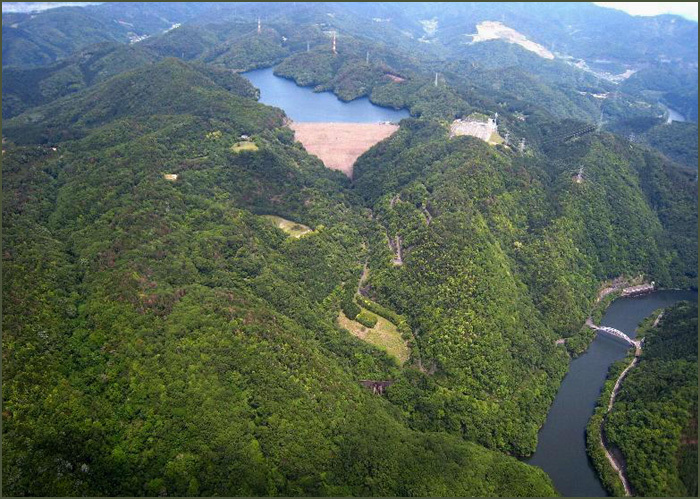 Tamuramaro fought against the local tribesman, 大多鬼丸」（大滝丸） Otaki Maru, who lived in a cave at 大滝根山 Mount Otakine san (1,192 m). 延鎮上人 Saint Enchin had carved the statue of Kannon at temple Kiyomizudera and from the left-over pieces of wood had carved 鞍馬 100 wooden horses with saddles and sent them to Tamuramaro. Tamuramaro put the horses in his armor and left for Tohoku. When he was in a pinch fighting, all of a sudden 100 horsemen came out and helped him fight at Mount Otakine. When he returned in triumph, the horses had disappeared from his armor. One day later, one of the wooden horses was found all sweating at 高柴村 Takanomura village near 三春 Miharu. 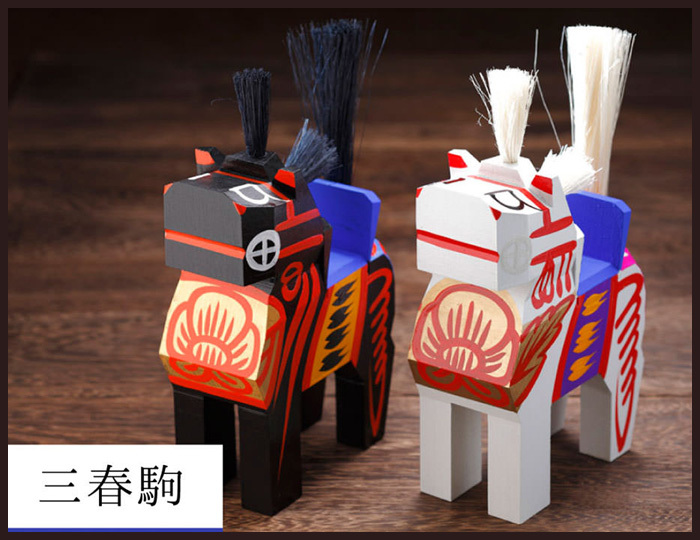 A man named 杵阿弥 Kiami realized it was one of the wooden horses given by Enchin and out of piety he carved the other 99 anew. Three years later, the one horse became missing. The family of Kiami still preserves the memory of the wooden horses. When they gave a horse to a family with an ill child, the child got well very soon. Now the horses are a kind of amulet for bringing up healthy children in Miharu. People kept them as talismans for an easy birth of their horses. They also build statues of a Kannon with a horsehead (Bato Kannon) at the entrance of their villages to protect their animals.
. Miharu koma 三春駒 horses from Miharu . 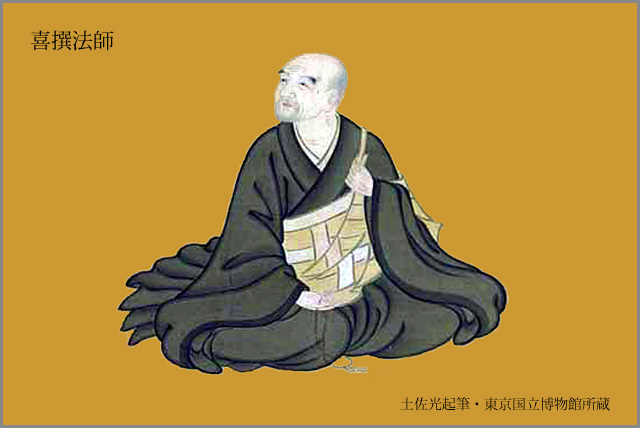 was an early Heian period Buddhist monk (僧 sō) and poet. Little is known about his life other than that he lived in Ujiyama. 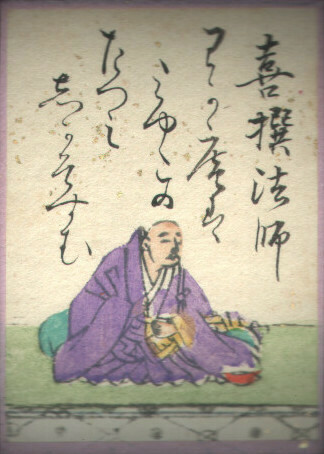 When Ki no Tsurayuki wrote the Japanese preface (仮名序 kanajo) of the Kokinshū, he selected Kisen as one of the six poetic sages (六歌仙 rokkasen) whose work was to be considered as superior. Tsurayuki says the following to comment on Kisen's work. kotoba kasuka ni shite hajime wohari tashikanarazu. The use of words is a delicate thing—from start to end it does not express the thing that actually is. ihaba, aki no tsuki wo miruni, akatsuki no kumo ni aheru ga gotoshi. That is to say, to speak of the autumn moon, one compares it to the clouds at dawn. 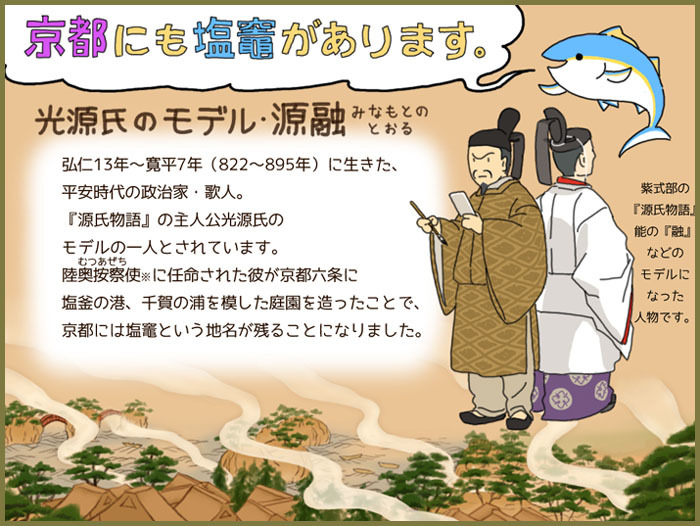 is sometimes said to be the author of the poetry collection waka sakushiki (倭歌作式) (also known as the kisen-shiki (喜撰式)), but it is probably apocryphal and created well after the end of the Heian period. The following two eika (詠歌) of Kisen are the only poems that can be confidently traced back to him. People say that I am a secluded hermit living in Ujiyama, but my hermitage is just to the southeast of the capital! What I see through the trees seems to be the fireflies (蛍 hotaru) from the valley—or is that the luring fires (漁火 isaribi) of the fishermen as they head to the sea? a rockfill hydroelectric dam finished in 1970.
is a series of ukiyo-e prints designed by the Japanese artist Utamaro and published in c. 1795–96. 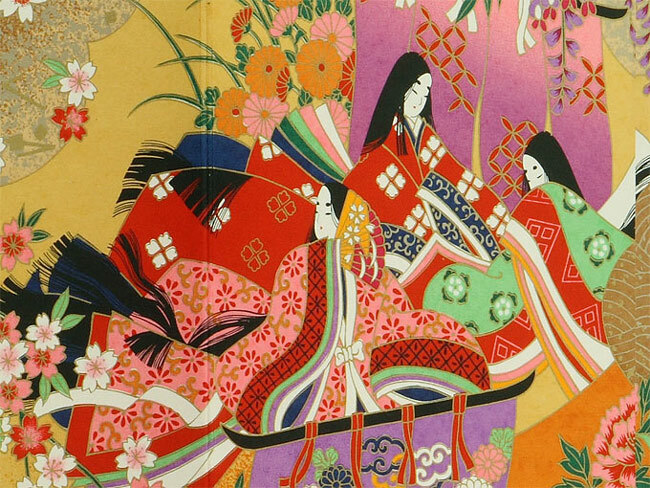 The subjects were well-known courtesans, geisha, and others associated with the Yoshiwara pleasure districts of Edo (modern Tokyo). 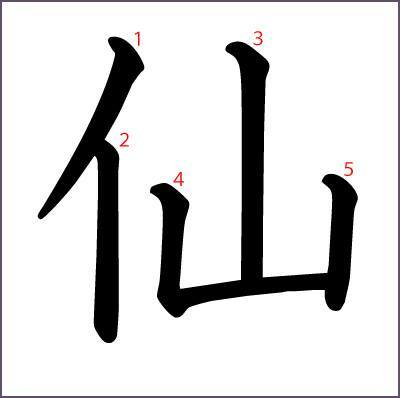 "Henjô" (Gidayû), "Bun'ya" (Kiyomoto), "Narihira" (Nagauta), "Kisen" (Kiyomoto/Nagauta) and "Kuronushi" (Nagauta). 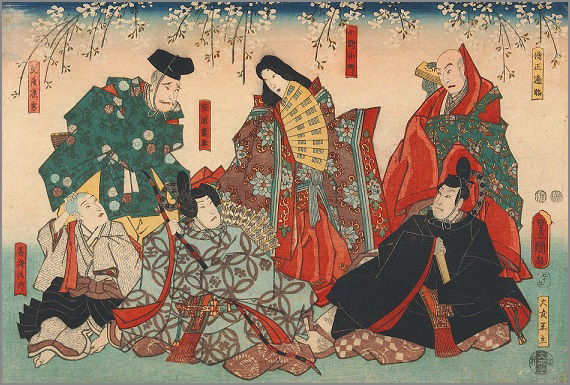 The Rokkasen (六歌仙, "six poetry immortals") are six Japanese poets of the mid-ninth century who were named by Ki no Tsurayuki in the kana and mana prefaces to the poetry anthology Kokin wakashū (c. 905–14) as notable poets of the generation before its compilers.
. kigo - hotaru 蛍 firefly .
. 本朝神仙記伝 / 本朝神仙伝 Honcho Shinsenden . He was born in 上野国 Kozuke no Kuni (now Gunma). He is first mentioned in 1875. He was first seen in 六月（みなづき）村 Minatsuki mura by a farmer, named 信平（しんべい） Shinbei. "Dear man, if you eat this you will never get ill until you die." He gave the man the fruit of a tree named komoshii コモシイ. The tall man said that he was 神仙にも天狗にもあらず neither a Shinsen nor a Tengu. He had left the world of dust behind him and lived in the mountain, not counting the years he had been there. There is a famous Gotenbayashi Forest in Yamagata.
. hatsu higurashi 初蜩 first Higurashi . 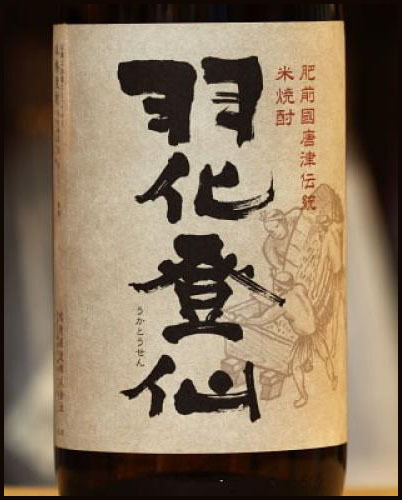 shinsendoo 神仙道 Shinsendo "the way to gain longevity"
It is repeatedly stated in Lüshi Chunqiu that death is unavoidable. 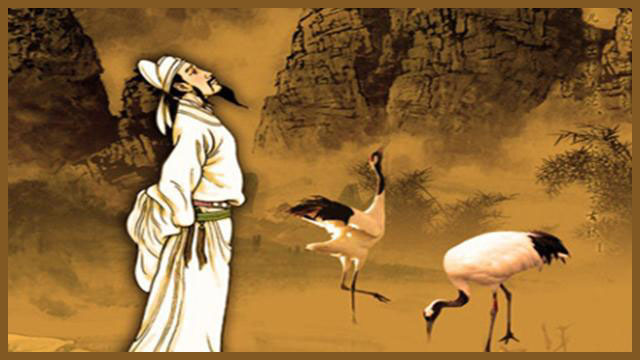 Henri Maspero noted that many scholarly works frame Taoism as a school of thought focused on the quest for immortality.
. The Elixir of Life and Immortality .